Those of you who have followed this website know that many months ago, I predicted that Marine Le Pen would likely be the next president of France. Of course, the caveat was that she would have to get through the second round of the presidential election in May of this year. You see, there are currently 15 candidates–ranging from very colorful figures to center-left technocrats–who are vying for the position. They must be weeded out before a final vote can be cast. However, in fact, there are really only four French presidential candidates who stand a real chance of winning. Now, when I published the original article, at the time, the real battle was between two figures on the Right: the aforementioned Marine Le Pen and the more conventional, cosmopolitan conservative, François Fillon, and an unlikely dark horse candidate, the Socialist, Jean-Luc Mélenchon. Now it appears that Fillon has become mired in a corruption scandal that seems to have rubbed the French electorate the wrong way. However, as I explained in the initial article, Fillon’s unattractiveness to a majority of the electorate was due to the socio-economic conditions that France found itself in. Mainly, Fillon was a conventional conservative, meaning that he was a nominal Catholic (meaning, secular person) who favored open borders and was generally supportive of the European Union. In other words, like the center-Left candidates, Fillon was an agent of the status quo. Plus, as a conservative, he was automatically in the minority, since so many people in the French electorate favor a larger role of the state in their daily lives (France is a social democracy with a cradle-to-grave entitlement system that has widespread support from its citizens). Furthermore, his continued support for the European Union and for open borders put him at odds with the French people (even some fellow Rightists in France). The French citizenry are dubious of the EU because they see it as a means of sapping French national economic strength and as a way of allowing for greater immigration into their country (i.e. the EU’s open border mandate), which many associate (rightly) with the increase in Islamic terrorism in France. And, as I noted in my previous article on the matter, Fillon’s secularism became a political burden for him since the former Catholic country-turned-secular-state was rapidly moving back toward Catholicism, in the wake of declining economic opportunity and with the prevalence of Islamic extremism in France today. Lastly, Fillon’s corruption scandal in which he had accepted bribes (in the form of $13,000 worth of suits) and had paid his wife and other family members exorbitant public funds for not actually working, only contributed to his recent decline in popularity in the French election. Virtually every French presidential candidate this election cycle has been “flour bombed” at some point on the campaign trail. Marine Le Pen has not (yet). In this image, François Fillon is bombed while speaking before cameras. So, while Fillon will continue to be a major contender going into the first round of the French presidential elections on 23 April 2017, it is unlikely he will make it into the second round on 5 May 2017. The two candidates best positioned to make it into the second round of the presidential election in France are the Right-wing Marine Le Pen (an underdog in this race, for sure) and the extremely bland center-left technocrat, Emmanuel Macron. Despite the fact that Macron is clearly the darling of the media, and despite the fact that several observers insist that he will be victorious, I am dubious of this outcome. While I will not totally write this off as a possibility, I would value Le Pen’s chances of winning at anywhere from 40-60% likely at this point. Remember, the Mainstream Media in the West has been consistently wrong in its interpretation of nationalistic populist candidates this last election cycle. Need I remind anyone that a majority of these sources proclaimed that Brexit would never happen or that Donald J. Trump would ever win the presidency? Those who are writing Le Pen off are wrong to do so. After all, if Macron’s chances of victory were so great, why did the French news services start insinuating that the Russians were influencing the election to favor Le Pen? If my preferred candidate were slated to win (and those “scientific” polls were universally “proving” this “fact”), why on Earth would I want to claim that my preferred candidate was going to lose because of Russian meddling? Also, the key issues that seem to be dominating French politics as of late have been 1) Islamic extremism, 2) immigration policy, and 3) economic decrepitude. 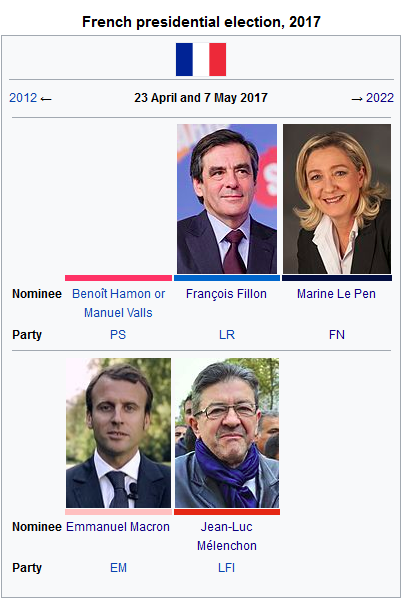 By a simple comparison of who supports what of the two candidates who I believe will make it into the second round, it becomes clear who the French voters would likely favor–even if most observers will not make such a determination (after all, hard-Left candidate, Jean-Luc Mélenchon is on the rise, as is embattled candidate, Fillon, as both Macron and Le Pen experience a dip in their polling numbers). Macron downplays the threat that Islamic extremism poses to France (even in the face of a spate of gruesome terror attacks in the last month). He is also an avowed supporter of the EU, meaning that he favors the EU open borders immigration policy. Finally, as an EU supporter, Macron implicitly believes that the economy in France is as good as it can get. Pictured here is Brigitte Macron (left), Emmanuel Macron’s former grade school teacher and a woman who has grandchildren and is 24 years older than Emmanuel. What’s more, Macron comes across as a strange figure. He is not well known. What is known about him will likely turn the French voters off. Compare this to Marine Le Pen, who is a very well known commodity in French politics. And, despite the controversy that her father imbued, she has spent the last two decades remaking the National Front Party into a respectable alternative voice for the Right-wing in France. Furthermore, she has a respectable daughter (who is also a French political figure and leading member of the National Front Party) and appears to embody solidly French values (she is unapologetically Catholic). Unlike her other serious rival on the French Right, the aforementioned François Fillon, Le Pen supports the French entitlement system–she just wants to make it solvent and inaccessible to most immigrants in the country. These factors all coalesce, in my mind at least, to indicate that Le Pen will likely be victorious in her presidential bid. And, just for the record, my track record is 2-0. As a former resident of the United Kingdom, I warned everyone that Brexit was real. I started The Weichert Report, in part, to outline why I believed Brexit would happen if for only the fact that very few academic publications would accept my writings on this issue. Furthermore, as my regular readers know, I predicted Donald Trump’s victory almost immediately. I only bring these two factors up because I have devised a very simple system for anticipating these trends. You see, at The Weichert Report, I have devised a simple matrix for analyzing the current wave of anti-globalist nationalism sweeping the world currently. It is by no means fool-proof, but it has served me well in my assessments thus far (which is why you all continue coming here). The more that these four basic points are in the affirmative position, the more likely that I believe a country–particularly a Western nation–is about to take a hard nationalistic, populist turn. In this case, France is firing in the affirmative on all areas. Since the 1970’s, Europe as a whole has happily encouraged the increased immigration from its former colonies in the Developing world (particularly from the Muslim countries) to offset the significant decline in population throughout Europe. Laqueur also documents how asylum seekers in Europe–particularly to countries like France and Germany–exploded beginning in the 1980s. And, as Laqueur notes in his work, “Among the political asylum seekers there were Islamists or even terrorists who were indeed in danger of being arrested in their native countries, but for reasons that had nothing to do with the struggle for democracy and freedom.” This trend has only continued. In Europe, this is especially pernicious. Indeed, not only are the asylum seekers devouring entire sections of Paris and southern France, but illegal immigrants swearing fealty to the Islamic State and other jihadist networks are descending upon the open borders of France. In France, most of the Muslim immigrants are of North African origin (not surprising, since France had many colonies in North Africa). Religion is also a very important aspect of the Muslim immigrant population in France. In the 1980s, the number of Mosques in France was a bit more than 200. Since then, that number has skyrocketed by at least a factor of ten. In and of itself the number of Mosques and the percentage of Mosque attendance (above 60% of French Muslims regularly attend Mosque services) is meaningless. But, when taken together with the fact that the number of radicals within the French Muslim community has grown exponentially, and the fact that this population is largely unemployed and very young, one can see trouble brewing. 1 in 6 French citizens polled say they have a favorable view of the Islamic State (IS). Source: VOX. Besides, as Mark Steyn documents in his book on the subject, “America Alone: The End of the World As We Know It”, the French (and overall native-born Europeans) are not the most accepting people in the world (despite all of the squishy EU rhetoric to the contrary). Thus, the Muslims in France arrive, are isolated, given easy access to France’s strained welfare system, encouraged not integrate with larger French society, re-create the conditions of their homelands in France, and are essentially out-birthing the native population. Marine Le Pen has been categorically opposed to increased immigration into France and firmly believes that if one is to enter France, one must become fully French. She has supported things like the burqa ban, she has made comments opposing public Islam in France, and she wants to limit immigrant access to France’s welfare state. These are all wildly popular stances that most French voters have. This is one of the biggest factors playing out in French politics today. It is also one of the reasons why so many French have turned against the EU generally and the French politicians–on both the Left and the Right–who unquestioningly support France’s continued presence in the EU. We in the U.S. keep talking about the “Deep State” within the U.S. government apparently arrayed against President Donald Trump. However, the country with the greatest “Deep State” is none other than France. For years, unelected elites within the French government have been directing French policies. The French voters were usually quite aware of this and accepted this as a fact. What’s more, French elected leaders were notoriously corrupt. How many of you have heard endless jokes about French leaders and their mistresses? Moreover, French political leaders and private interests have often intersected in what, in today’s America, most would adequately define as corrupt practices. However, in French politics, again, it is simply business-as-usual. “French corruption involves vast sums and takes place at the highest levels of government.” – Robert Zaretsky, writing in Foreign Policy. Yet, over the last few years, many French voters have been changing their perspective on this issue. While most may not become the kind of “moral majority” voters that many American voters are, many French voters are no longer accepting of the usual excuses from their leaders. This explains why Fillon’s popularity plummeted after the corruption allegations were made against he and his family. In another era, Fillon’s transgressions would have been largely ignored. In this case, Le Pen, despite being a well known figure in French politics, was always perceived as an outsider. She was not a member of the elite. She did not benefit from the kind of corruption that so many French politicians seem to live off of. The French people know this. This perception of her plays well into her campaign. It is this reasoning that also plays well into Le Pen’s calls for ending the French role in the European Union. And, as you will see in points three and four of my matrix, Le Pen’s outsider status combines nicely with the socio-economic realities in France. Also, and this may be related to the perception of elite corruption, it is expected that a majority of French citizens will actually decline to vote in the second round of elections. While there is no way of knowing this for sure, this is a very interesting theory, considering a lack of voter turnout is how many populists have risen to power over time. You see, Macron does not have popular support and several other candidates are perceived as unelectable by the French electorate. Only Le Pen and her stalwart supporters are galvanized. So, she has a clear advantage if these reports are true. This point is a difficult point to make, because of the fact that the French welfare system “evens” the proverbial playing field in French society. While there is a select group of incredibly wealthy elites in France, these individuals pay high sums of their money to the French government, which then redistributes these funds into large social programs. “Free” college, unemployment, mandatory vacation periods, paid maternity leave are all social programs that the French state has taken financial responsibility for. However, it is imperative to note, that the French have an incredibly high cost of living throughout the country and the ability for economic opportunity is hamstrung by onerous levels of government regulations and taxation. As you can see, the French unemployment rate has not dropped below 10% for some time. Also, French unemployment has been chronically high–going back decades. This has had the effect of disempowering the native born population, making them increasingly reliant on the French government for nearly every aspect of their lives. Yet, the population problem continues to plague France (and much of the Western world). Basically, without immigrants, the French population is mostly old. In order for the massive cohort of French retirees to be sustained on the government dole (as so many will be), they need a disproportionately high number of young workers to replace the retirees and continue to pay taxes able to sustain the large demand on the French welfare state. Since most French citizens eschewed having more than a single child over the last four decades, the French welfare state will not be able to pay out the goods it has promised to future generations. Add in the massive cohort of Muslim immigrants to the country, many of whom are not contributing to the welfare state but are, in fact, disproportionately benefiting from the welfare system there, and you have a perfect recipe for an exponential increase in not only actual inequality, but more importantly, the perception of inequality which, heretofore, has been kept on the back burner, thanks to the supposed economic success of the EU economy. So, while points one and two of my matrix are a very high degree in the affirmative, this point has not yet reached its crescendo. I would argue that this is the weakest factor working in favor of Le Pen’s potential victory. However, we cannot discount the importance of this present (and growing) factor on how a majority of the French citizenry will vote. Who can honestly say that the overall European economy has not been laid low by the Great Recession of 2008 and the pitiful, anemic (non) recovery that followed? In the ensuing years since the Great Recession, there have been fiscal policy imbroglios, debt crises, and overall shocks to the economic structure in Europe that France has been most negatively impacted by. Plus, although one of the founding members of the European Coal and Steel Community (ECSC), the precursor to the EU, France has become increasingly disillusioned with the EU. After all, the French envisioned the ECSC and, later, the EU as a means for offsetting what they perceived as American “hyperpuissance.” Although France partnered with the Germans early on in the formulation of this customs union, France was generally perceived (and the French perceived themselves) as the dominant actor in the community. This changed over the years. The EU never fully became the conduit for French dominance in Europe that people like Charles de Gaulle and, decades later, Jacques Chirac, envisioned. The EU was a free trade and customs union. Therefore, the greatest advantages would be conferred upon those states with the strongest economies. Coming out of the Cold War, after the Treaty of Maastricht was signed in 1992 that officially created the EU as we know it today, Germany rapidly ascended to its historical position as the economic powerhouse in Europe. With the loss of Britain (what was the world’s sixth largest economy when it was in the EU), Germany’s dominant role in the EU has only been reaffirmed. Make no mistake: the Franco-German rivalry may have been quiet over the last several decades since the Second World War, but it is by no means gone. Hopes for greater political unity between France and Germany, and the perception of economic prosperity that the EU conferred upon its members, kept the rivalry at bay. But, over time, the decrepitude of the French economy (compared to Germany’s) became apparent. French leaders realized that they could never be a dominant force in European politics the way the Germans were. Thus, while many observers continue to frown at the fact that Marine Le Pen’s election will not only signal a “FREXIT” of the EU, but will also portend the ultimate demise of the EU, are likely wrong. Make no mistake, I am an avowed Euroskeptic and believe firmly that the EU is simply too big to succeed. However, France’s role in the EU is not all that important. Therefore, the only European state capable of determining the EU’s survival is Germany. So, this is not so much of a concern of mine. Given French ambivalence toward the EU, the fact that France has been negatively impacted by the Great Recession and its aftermath, and the fact that there seems to be no real economic reversal on the horizon, this fourth point means that the French electorate is likely willing to give a radical solution, such as the election of Le Pen, a chance. So, there you have it. The French presidential election is going to be wild. The first round on 23 April, will be virtually meaningless, as I suspect that only Macron and Le Pen will survive the first round. However, as I indicated in the above portion on the French “Deep State”, French politics can be quite corrupt. Who knows what might happen between rounds of voting? Only the faceless agents of the French state and wealthy French power brokers know this. Barring any nefarious business of that sort, Le Pen’s chances of winning are greater than what most in the media are stating. Also, her election is not the end of Europe, but rather, its last attempt at rebirth. More importantly, from the French perspective, her victory would likely reinvigorate the otherwise ailing French state at a critical point in French history. While I personally believe that the real problem in France is its burdensome government that oppressively taxes and over regulates its citizenry in a quixotic effort to support a failing welfare state, Le Pen clearly does not agree. She has made amends with the welfare state which is what has made her more popular among the Right in France than Fillon. Rapid increases in immigration coupled with socio-economic changes in both Europe overall and France in particular are generating a mass reaction in the form of Marine Le Pen’s populist nationalism. French Socialist candidate, Jean-Luc Mélenchon is the real wild card in the first round of voting. He is the Bernie Sanders of this race and he wants to raise taxes on income-earners and double-down on French government spending, in order to stimulate the anemic French economy. This is why, I believe, she will ultimately win. Though, time will only tell. And, should Macron somehow be knocked off in the first round, and should the ultra-Socialist candidate, Jean-Luc Mélenchon win, I believe that he could topple Le Pen’s ascendancy. However, such an outcome is unlikely. Next France For All Or France For the French?